What Kind of Food Should I Feed My Diabetic Dog? Controlling the diet of a dog with diabetes mellitus is probably the most important part of treating the disease, with the exception of insulin injections given at periodic intervals. Regulating the blood glucose levels (sugar in the blood) is the key to controlling and treating the symptoms of diabetes. Without a properly controlled diet, keeping the blood glucose levels within acceptable limits is impossible. This is because any food that your dog eats has a direct impact on its blood glucose levels. The types or quantities of food will cause differing reactions. The American Animal Hospital Association (AAHA) guidelines say the type of food fed to a dog with diabetes is much less important than the consistency of the diet. As long as the food is a high-quality diet that is complete and balanced, your diabetic dog will do fine with it. If you haven't been paying much attention to your pet's diet, talk to your veterinarian to get recommendations for a balanced diet. One thing to avoid is food with simple sugars. These will raise your dog's blood sugar level. Avoid giving any treats or table scraps that contain sugar or sweeteners such as corn syrup, as well as high glycemic foods that quickly boost blood sugar, such as white rice and bread. Have a discussion with all of your family members about why it is not good to give your dog treats or scraps, no matter how much your dog begs. If your dog is overweight, increasing the soluble and insoluble fiber can help in weight management. Some dog food is formulated in this way and it can help improve blood sugar control as well as weight loss. However, if your dog is underweight it will need a high-quality maintenance diet instead. Some dogs with diabetes also have pancreatitis, a condition that does best if the dog avoids foods high in fat. But it is important that the reduction in fat isn't accompanied by an increase in carbohydrates. After your dog eats, its blood glucose level will increase. Insulin will work to drive the glucose levels back down and keep them within a normal range. If your dog gets one dose of insulin daily, the first meal should be 2/3 of the daily ration and be given before you give the insulin injection. You will give your dog the second meal with the final third of the daily ration six to eight hours later. If your dog is given insulin twice daily, it should be fed two equally-sized meals 10 to 12 hours apart, with each meal given at the time of the insulin injections (or just prior). Don't give a larger and smaller meal as the dose of insulin will be aimed at meals of the same size. It's best not to use a self-feeder or allow a dog with diabetes to be free feeding. Your dog needs the structure of having meals timed with insulin administration for management of diabetes to be the most effective. It's important to keep your dog's diet consistent. Feeding the same quantity of food at the same time each day and not varying the type of food given will help to keep your dog's blood glucose levels steady and within the normal range. You will be working with your veterinarian to get the correct dosage, and this is based on consistency. Discuss any changes you wish to make in your dog's diet with your veterinarian. You may need additional blood glucose monitoring when making a change to ensure it doesn't result in damaging swings in blood sugar. The quantity of food—or more specifically, the number of calories—should be geared toward keeping your dog at a lean body weight, or returning your dog to a lean body weight if it is obese or overweight. Though diabetes is not caused by being overweight, dogs that are overweight or obese are less healthy than those that are kept lean. 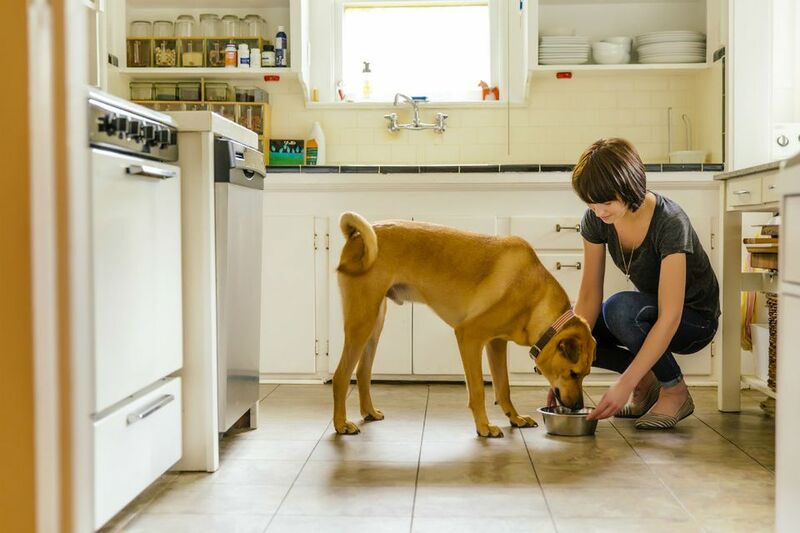 Because dogs with diabetes are usually insulin-dependent, the amount of insulin given can be adjusted to adequately control the blood glucose level based on your dog's physiological reaction to the food it is eating. Keeping its diet consistent will avoid having to make frequent unnecessary changes in insulin requirements in response to constantly changing blood glucose levels. If your pet's diet and exercise regimen are consistent, your dog's insulin needs are more likely to remain consistent as well—though you should monitor and it may need to be adjusted on occasion. Should I Stop Letting My Dog Sleep With Me At Night?